Delhi, one of India’s fastest growing cities, has spread far beyond the “seven cities” created between the 13th and the 17th centuries. It has sprawled over the west bank of the Yamuna and now straddles the river itself. Remnants of the past survive cheek-by-jowl with skyscrapers, residential colonies and bustling commercial complexes. Delhi has some of the finest museums in the country. Its boutiques and shopping arcades offer access to a wealth of traditional and contemporary crafts from all over the country. It has speciality restaurants to please the gourmet, open parks and gardens ablaze with flowers, and in the winter months particularly, a variety of cultural events. Its many-layered existence is tantalising and can entice the curious traveller into a fascinating journey of discovery. In 1526, Babur founded the Mughal empire in India. The impressive Purana Qila, Delhi’s sixth city, is a combined effort of his son Humayun and the Afghan Sher Shah Suri who temporarily deposed him. The fort contains a fine mosque and what was possibly a library. Nearby are the Zoo, the Crafts Museum, where craftsmen work in a simulated rural setting, and Pragati Maidan, the exhibition grounds. 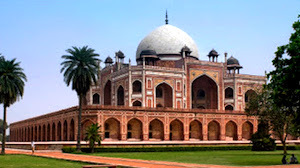 The magnificent tomb of Humayun, which is a precursor to the Taj Mahal is 2 km from here. In April 1639 the Mughal emperor Shah Jahan laid the foundation of Shahjahanabad. 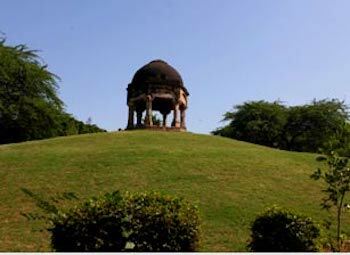 Delhi’s seventh city, and it epitomised the grandeur of his empire. This walled city has since been continuously inhabited. It is one of the most densely populated localities in the world and it retains a unique vitality and charm. The Red Fort, Shah Jahan’s sandstone citadel encompasses grand audience halls- where the legendary Peacock Throne once stood – and marble palaces ornamented with exquisite pietra dura. Opposite the Red Fort is the Jama Masjid, India’s largest mosque. For the intrepid traveller there is more. Chandni Chowk, the moonlit square, is adjacent to the mosque, and leads to the heart of the walled city. This was once a tree-lined bazaar with a canal flowing through its centre. Today, it is one of the largest trading centres in northern India – thriving, congested and chaotic. Chandni Chowk is replete with historical landmarks and each of its bylanes leads into a world of spices , silver, perfumes or textiles. New Delhi was built in 1911. It was to be “conceived with spaciousness and care so that the new creation would be in every way worthy of this ancient and beautiful city”. Lutyens and Baker planned a city with wide, tree-lined avenues. The 340-roomed Viceregal Lodge, now the Rashtrapati Bhawan, was raised on Raisina Hill. Nearby are India Gate, a World War I memorial, Parliament House, the prestigious National Museum and the National Gallery of Modern Art. On Republic Day, Rajpath witnesses a display of pageantry. 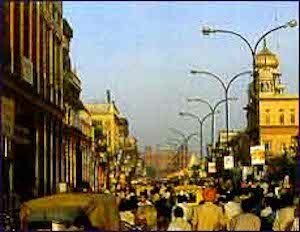 The classy commercial centre of Connaught Place was planned as part of New Delhi. Along with stalls on Janpath, and emporia on Baba Kharak Singh Marg, it is a shopper’s paradise. 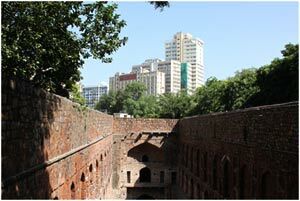 Rather characteristically, an 18th century masonry observatory, the Jantar Mantar, lies in the midst of this commercial area. But there is still more to Delhi… Art galleries and theatres, and a variety of museums, memorials to leaders, Hindu, Sikh, Buddhist, Jain and Bahai temples, folk dancers, discotheques, urban villages… even birdwatching along the ridge. Come discover a country through a city.